The homicide rate for Indigenous females between 2001 and 2015 was nearly six times higher than that for non-Indigenous females, according to a new study by Statistics Canada. The difference in rates was most notable in the territories and in Manitoba, Alberta and Saskatchewan, according to the report Women in Canada: Women and the Criminal Justice System, released Tuesday. 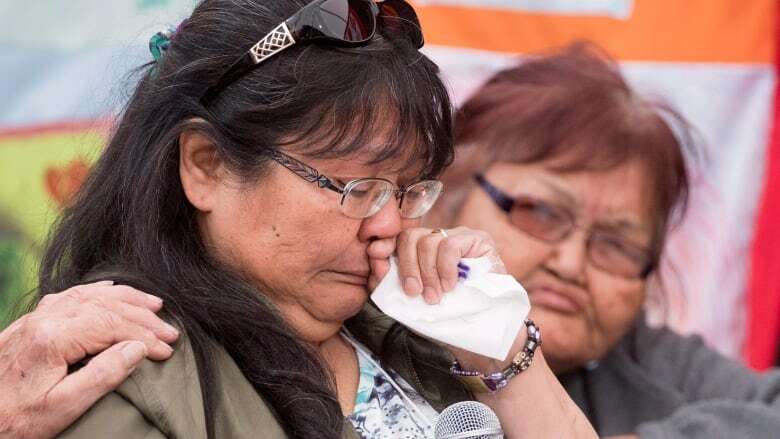 One quarter of all female homicide victims in Canada in 2015 were Indigenous, up from nine per cent in 1980. 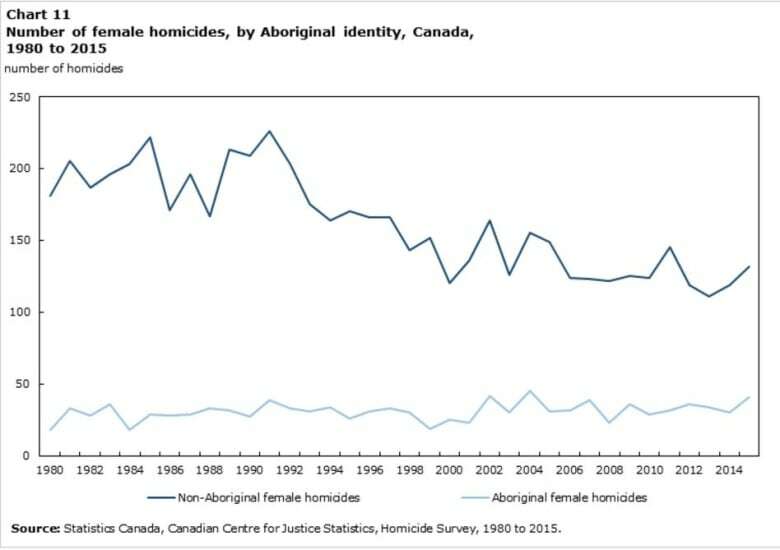 The report says the number of Indigenous female victims of homicide has increased over the past several decades, while the number of non-Indigenous female victims has declined. Indigenous females reported experiencing violent victimizations at a rate 2.7 times higher than that reported by non-Indigenous females. More than three times as many Indigenous women reported experiencing spousal violence in 2014 as non-Indigenous women, and Indigenous women were nearly twice as likely as non-Indigenous women to report having experienced emotional or financial abuse. According to the study, females accounted for 10 per cent of people accused of homicide in Canada from 2001 to 2015. 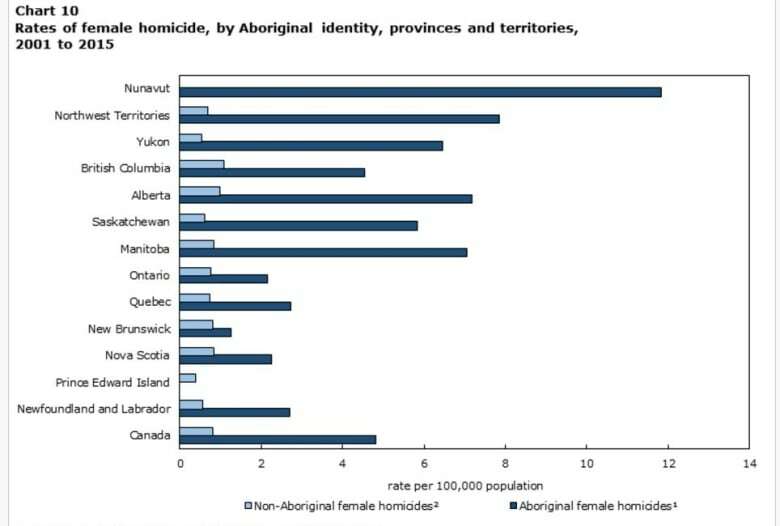 The rate of Indigenous females accused of homicide was 31 times higher than non-Indigenous females (4.33 per 100,000 population compared with 0.14 per 100,000 population). Indigenous women made up less than five per cent of the total female population in Canada in 2015 but accounted for more than one-third of female admissions to federal and provincial/territorial custody in 2014-15. The largest proportions were in the western provinces and the territories. In 2014-15, 86 per cent of women admitted to adult provincial sentenced custody in Manitoba were Indigenous. That number was 85 per cent in Saskatchewan. In 2011, Indigenous females 15 and over made up 14 per cent of Manitoba's population, and 15 per cent of Saskatchewan's. In the territories, where Indigenous females comprise a larger proportion of the populations, Indigenous females made up 82 per cent of admissions to custody in Yukon, 93 per cent in the Northwest Territories, and 100 per cent in Nunavut.